The June meeting, led by Bob Torbet, was held at Jack Putnam's. The treasurers report was given by Jack Putnam. We had a total of 14 members and guests present. Everyone was given a chance to introduce themselves. The big topic of the meeting was all of the upcoming events. Jack mentioned the Bluffton show on June 13th and the Backstreet event in Findlay on August 23rd. The club has committed to the Wapakaneta parade on Satruday, June 21st and the Forest parade on July 11th. Please plan to attend the parades if you have a running car. The club receives money if we have 5 cars at the Forest parade. A Lake Erie tour in the fall is still a possibility. We're trying to miss the busy season and still not freeze. It was agreed to skip the July meeting and have our summer picnic in August. Please note that the August meeting will be at Bob Hollister's and is one hour earlier than normal. Please bring guests and a passing dish and/or desert. The meat will be provided by the club. Directions to Bob's house will be noted below in the newsletter. 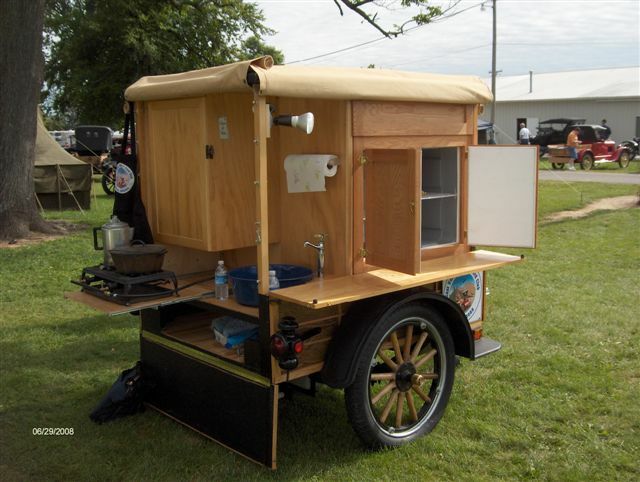 Here are two shots of a chuckwagon built on a model T rear end. I'm leaving the pictures big so that everyone can see the fine workmanship. This model was made by the members of the East Valley Model T Ford Club of Mesa, Arizona. The suspension looks like it may have been modified slightly. 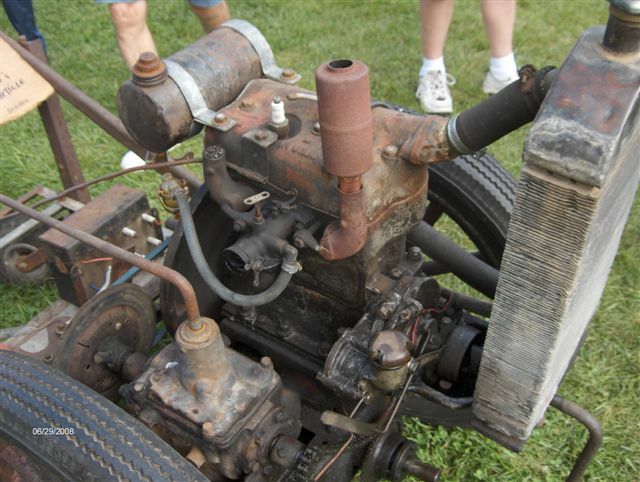 This is a Model T engine that has had the 3rd and 4th cylinders cut off to make a 2 cylinder engine. It doesn't seem like it should run; but surprisingly they run quite well. It has been my experience thay you need to spin the crank to get it going. 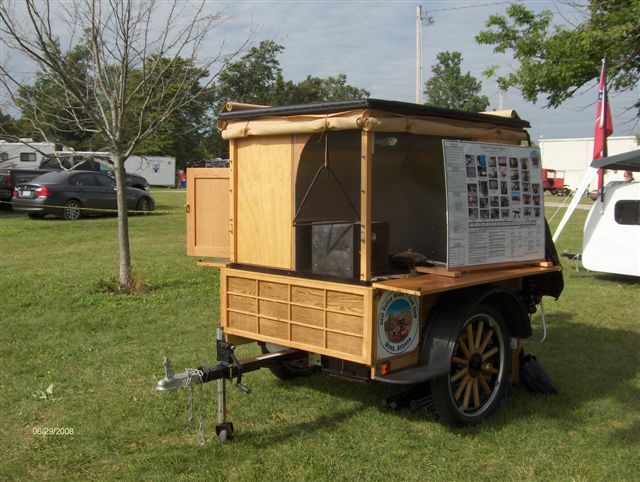 This particular model was used for a mobile farm power supply. The club has officially participated in 2 parades this summer. The first was the Wapakaneta Parade to celebrate the aniversary of the founding of their community. We were happy to see Melvin & Erna Gierhart in their Model T. The real joy was when Marge Lafollette and her son pulled up with the Model A. It is always good to see the next generation showing an interest in the cars. When the folks in charge of the event finally let us go, Dave & Janet Benny led the way. I just got "Old Henry" rollin' and shifted into high gear with the throttle set on its lowest notch. This drove Jack nuts. He was running a newer engine behind me and needed to give it a little more gas to overcome that new engine drag. As a result, he had to feather the low band clutch in and out to keep from catching up too quickly. Where: Bob Hollister's address is 18433 Twp Hwy 70, Arlington, Ohio. This is the township road that goes to the north, one mile west of Arlington. Just go north until you go over the hump in the road (old railroad righ-of-way) and turn onto the driveway. Now that route 30 is a super highway from Beaverdam to Upper Sandusky, those coming from the south would be best to take US 30 to SR 68 and travel north the Arlington. Turn left (west) on SR 103 and catch Twp Hwy 70 to the right (north) just one mile out of town. What: A Picnic!! Please bring a passing dish and/or desert. The club will supply meat. Who: Yourself and any guests that you think my be interest in spending some time with us. If anyone would like to swim, there is a pond. Many of you may remember the Centerdoor that was at the June meeting. We did manage to get it to run about one quarter mile down the road. Then it quit. I think Bob Torbet may have found the problem. Since that time, he has cleaned the entire fuel system and the car is working fine. Always remember the secret to any Model T problem is spark and fuel. If you have both it WILL run. Sorry Everyone, I Just Had to Add This One!!!! 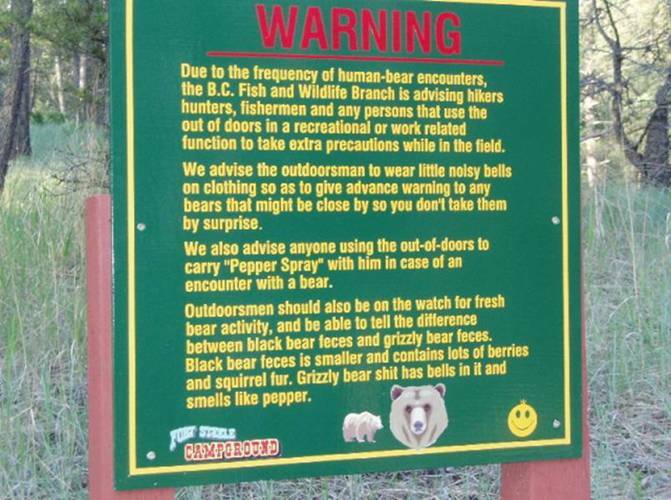 As an avid outdoorsman who has come face to face with my share of wildlife (including bear), I found this all too real and to-the-point. Its humor comes from its brutal truth.